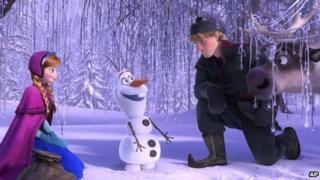 Disney animation Frozen has become the top-grossing animated film in box office history. The musical film has now made $1.072bn (£644.38m) globally, beating Toy Story 3's previous record of $1.063bn in 2010, according to Boxofficemojo.com. Frozen, loosely based on Hans Christian Andersen fairytale The Snow Queen, opened in North America on 29 November. The film has made $398.4m (£239.3m) in North America plus $674m (£404m) at the global box office. The movie, which stayed in the top 10 in the US and Canada film chart for more than three months, is now also the 10th biggest grossing film in box office history. Frozen scooped two Oscars earlier this year, winning the awards for best animated feature and best original song. However, according to the Hollywood Reporter, the animation is facing stiff competition from Warner Bros and Village Roadshow's The Lego Movie, which was released in February and has already made more than $400m (£240m) globally - the first film of 2014 to do so. And the Lego Movie has not opened everywhere yet - it is due to be released in Australia on Thursday and in Germany next week. Meanwhile, Frozen's soundtrack has also been a huge success - it is currently top of the US Billboard chart and sold 202,000 copies last week, according to figures from Nielsen SoundScan. That marked its biggest week in sales since its release on 25 November.